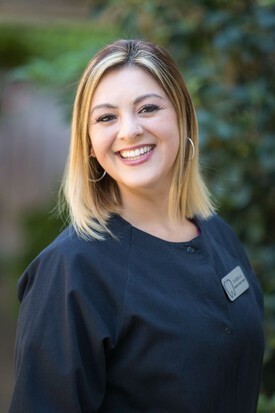 If you're a patient of Dr. Emam, you probably already know and love Faby, her "Faby-ulous" dental assistant! Faby's warm and caring presence is a special part of Dr. Emam's practice. Here's your chance to get to know this important member of our team! Why did you decide on a career in dentistry? In high school, I knew that I wanted to be a dental assistant and help others. As a child, I enjoyed going to the dentist and have good memories of my personal visits. Thus, I wanted to be able to help others and make sure others had a good experience without any fear just like I did. What are some things you like hearing from patients? I enjoy hearing how helpful I am, how gentle Dr. Emam and I are together, I enjoy when they say that they’ve had a good experience visiting our office. Please share a favorite dental story. I think my most favorite stories are when I am able to help patients get their gums in better shape and seeing the patients’ progress as they complete their goal. I enjoy helping them, teaching them and feel a great sense of accomplishment as a result. What should patients know about Dr. Emam’s dental practice? We strive to give our patients the best care possible. Dr. Emam is very sweet, gentle and caring in her dental approach. What are some of the “behind the scenes” things you do every day at work? Sterilize instruments, order supplies, clean the rooms and get funny movies for patients to watch during their visit. What would you tell someone who is afraid of going to the dentist or afraid of getting a dental procedure? I would tell them that Dr. Emam is very gentle with her procedures and is the best at giving injections. No need to fear when you visit our office. Most people are squeamish about the idea of looking at mouths all day! Why aren’t you? Because I like to help and teach others about oral hygiene.